This past weekend, I decided take to the entire weekend off after working a little extra during the week. The plan was to do the 'weekend vacation in my own State' thing. Turns out, I was only partially successful. The 'weekend vacation' turned out to be a working vacation as I drove all over the West side of Michigan conducting animation-related business. 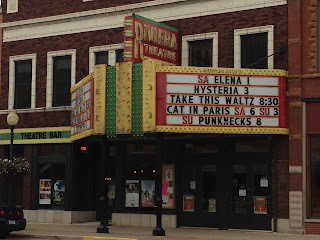 Saturday, I made the two hour drive down to the Rivera Theatre in Three Rivers, Michigan just so I could see the Academy Award nominated film: "A Cat in Paris." 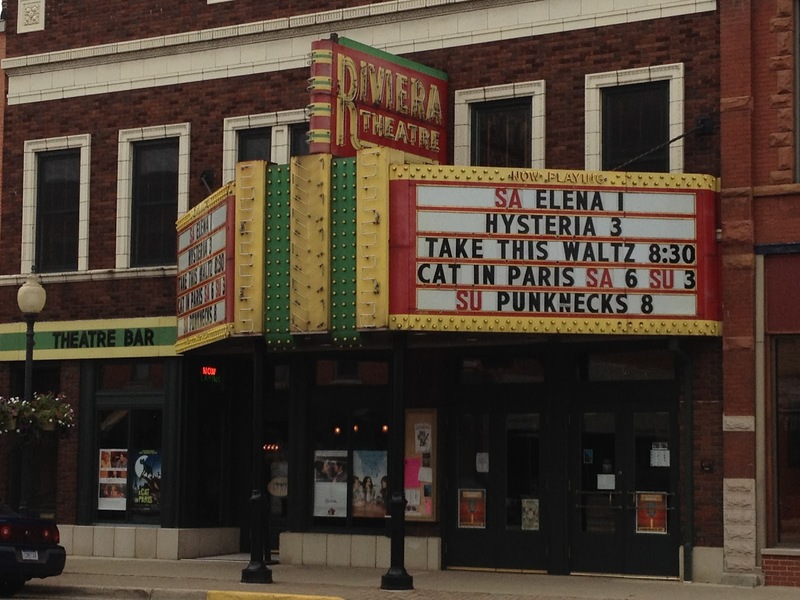 Only a two-hour drive from Lansing, the Riveria was my only "local" choice to see this movie. The other two locations closest to me were Huntington, Indiana and Chicago, Illinois. Since GenCon is coming up in August and I need to drive down to Indianapolis and schmooze with clients while druming up some more business, a four-plus hour drive to Indiana or Illinois wasn't very high on my list. Fortunately, before I had to make a final decision on which four hour drive to make, the Riveria Theatre swept in with a better alternative. So off I went, across the State and South of Kalamazoo towards one of those small cities with a main street that looks like a slice of Americana reminiscent of the stories my parents tell me about growing up in the 1950's. When I entered the Riveria, I was immediately struck by the ornate molding... and the pub right off to the left of the entrance. You know you're in the right place to see a movie when the theatre has a pub with Strongbow on tap. Reminds me of the Odeon--except no pub... and at the Odeon the alcohol was usually brought in by the patrons. You wouldn't notice it until halfway through the movie when a bottle would rattle its way down towards the screen. The screen may have been small and the sound system needed some tweaking, but I still left Three Rivers wishing that we had something like the Riveria Theater in Lansing! I'd watch a lot more indy film if we did... or at least I'd pester them to bring in a lot more animated feature films. 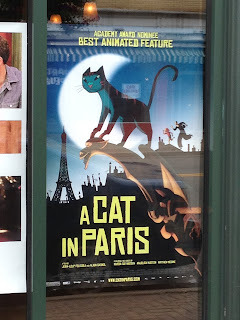 Which brings us to the reason I drove down to Three Rivers in the first place: "A Cat in Paris". This was a really cute film. The character design has that Eastern European feel that I normally only see in Clasky-Csupo shorts from the 90's. The characters moved with a level of fluidity that appeared to be based more on their personality and the requirements of their profession than on the perceived mass or volume of their bodies. But, as the entire film was stylized, it worked--especially when you see the cat burglar jumping around from roof to windowsill as effortlessly as Dino the cat does. The backgrounds were lush and beautiful. I found myself more drawn to the color than the structure as everything was painted with a backdrop texture suggesting that the entire film had been colored using colored pencils. This color/texture combination introduced a vibrancy into the film that meshed well with the fluid of motion without being distracting. I'm honestly surprised that it was called "A Cat in Paris." Dino the cat turned out to be more of a background character. In most scenes, he's relegated to the role of a MacGuffin used to bring the humans together. In the end though, it was the humans who drove the plot forward, not the cat. I suppose that there's only so much the cat could do in the span of sixty-nine minutes to hold our attention, so the presence of humans "was" required. While there were little jokes here and there for the adults in the crowd, this was definitely a film written for a childrens' audience--despite a turn towards the surreal at the climax of the film. But all-in-all, it was a fun little film that I look forward to adding to my DVD collection should GKIDS decide to release it in the States. Sunday saw me driving up to Grand Rapids so I could spend the day doing some sketching and collecting photo references with fellow animator and ASIFA/Central member David Van Tuyle at the John Ball Zoo. 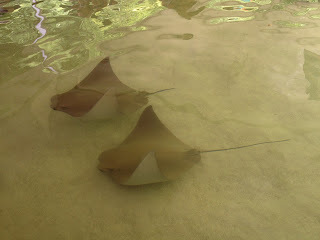 I have to give bonus points to the Zoo for having a tank filled with stingrays. The rays were very friendly and comfortable being around people--although as we approached lunchtime, they started sucking at our hands emparting a rather creepy sensation. Turns out that having been in captivity for so long, the rays associate human hands with food and they were expecting to be fed at the time that we were there. But still tired from yesterday's drive to Three Rivers, I didn't do as much drawing as I had hoped. However, I did get a lot of photo and video references of animals that we don't have down at Lansing's Potter Park Zoo--including Bears, flamingos, and monarch butterflies. I think that the reference I liked the most though was this clip of the stingrays which I filmed to show how they glide effortlessly through the water. As I watch this little video, I'm thankful for what technology has brought us. I can review this video over and over on my computer as I animate with my 3d programs, or watch the video downstairs on my iPad as it perches on the corner of my drawing table, should I decide to animate traditionally using the Mark I pencil. At times like these, it's hard to tell students not to get too attached to the digital tools that we use when many of them make it so convenient to study motion and anatomy. Even I have to admit that tweeners make it so easy to cheat when you're animating against a deadline. But when I hear horror stories about schools that only teach students the latest software instead of building a firm foundation based upon the principles of animation and the rules of filmmaking, I have to remind myself that in the end, whether your work is created with pencil or stylus, it's the animator and not the tool that breathes life into the subject matter--no matter how useful the tool may be. So I received my rejection letter from the Ottawa International Animation Festival today. My film was not selected for the competition screenings nor was it selected for the showcase screenings. To put this into perspective, the Ottawa animation festival is the second largest animation festival in the world and the largest in the Western hemisphere. This year they received 2,376 entries all vying for 151 competition/showcase slots. Given that my film was a limited-animation, quirky look at a real-life experience, I wasn't surprised that it didn't get accepted. I figured that I'd have around a one-percent chance, if that. Still, when you produce a film, there's always the lingering hope that it might get accepted into festivals and appreciated by the crowd. However, something cool that the Ottawa festival does is that, if your film is rejected, you can resubmit it to be shown at their Thursday night "salon des refusés" party/screening. And if you present your original rejection letter at the bar, they'll give you a free drink. In reality, this is the best outcome that I could have hoped for: the chance to finally finish a film, submit it to a festival, and get a free drink--and hopefully a few chuckles if my film is selected for the salon des refusés screening. Even though my film was rejected, I'm still left with the feeling that I've already won something more valuable. This is the second festival that I've ever submitted a film to--the first being a student competition put on by SMPTE/RAVA. After allowing so much time between film submissions, this year's entry was a learning experience as I had to review the competition rules, film submission specifications, and deadlines. Honestly, I enjoyed learning about the process almost as much as I did creating the film itself. By reviewing the entry guidelines for Ottawa when going into the production phase of my film, it allowed me to quickly retool the display settings, resolution, and video codec to match what they asked for in their submission guidelines document. It also gave me a larger amount of screen space to play with during production--something that I hadn't put a lot of thought into since I'm used to working in the limited screen space useful for embedding Flash movies into webpages. Normally, if I have to move between a Flash/HTML interface and a video screen, I compose the animations using SD guidelines and then use Adobe After Effects to scale up the vector animation to HD format. And I only do that because my laptop and computer don't work in HD very well. Yep, it's about time to upgrade. At any rate, by reviewing the OIAF guidelines, it allowed me to eliminate a time consuming step which provided the additional benefit of giving me more time to polish the rest of the films visuals, timing, and audio--a fact which became necessary when I discovered a week into production that I had created the wrong background and had to start over from scratch! Obviously, this won't always be possible--animating your film based upon festival guidelines--animation takes too much time, especially as your stories get more complex and you raise the bar for the visuals. However, with this experience under my belt, I'll be better prepared for the next film I create and the next festival I enter--if for no other reason that it's forced me to reexamine how I plan my films. This Fall, as I stand there at the Ottawa International Animation Festival, thinking about the next film that I'm going to produce and submit, I'll wager that drink will taste better than any I have ever tasted before. Since I've been a little late with these blog posts, here's an added treat for this month: a new Simon's Cat. When I watched this the first time, I started to get that feeling of 'been there done that' when the cat pointed to his mouth and did the whole 'feed me' bit. I had fallen into the trap of believing that the ending was going to be anti-climactic, so the presence of the kitten was unexpected and left me with a great laugh. I can't help but think that Simon Tofield planned this little 'gotcha' from the start. Much like playing with a cat using a laser pointer, Tofield led us right where he wanted us to go when setting up the final gag. Looking at the camera angles, shot selection, editing, polished visuals, animation and effects, it's clear that while this video might reflect what is in my memories when I remember watching shows like these, it is clearly not what was broadcast in 1976! Oftentimes, I'll watch animated series and shows from my youth (Mazinger Z, Voltron, Robotech, Speed Racer, Gamera, Godzilla, etc.) and will come to the sad conclusion that these shows appeared far more, ah, polished when I was a kid. It's even more telling when you watch shows with an animation degree and first hand knowledge of animation production since you can see every place where the production company cut corners to get the product finished and out the door. Although, in the case of the above video, I think that what we're seeing is more than just a limited budget and the target audience being a kids show. When I review the old Combattler V videos and compare them to this video, it's clear what a pronounced effect the leaps in technology from 1976 to 2012 have made. Now, if they can relaunch the old GaiKing series, perhaps it's time to revisit some of the other giant robot shows like Dangard Ace, Mighty Raydeen, and Mazinger Z and reproduce them with today's technology! "I am always doing that which I cannot do, in order than I may learn how to do it."